Britain’s Liberal Democrat leader Nick Clegg sought backing from senior party members today for a possible deal with the Conservatives after an election in which no party won an outright majority. 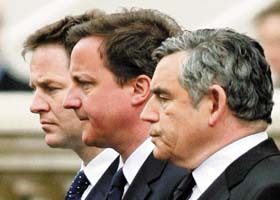 Britain's Prime Minister Gordon Brown (right) stands with Conservative Party leader David Cameron (C) and Liberal Democrat leader Nick Clegg during a Victory in Europe Day ceremony in London on Saturday. Pakistan will probe alleged links between Faisal Shahzad, the Pakistan-American arrested for the botched car bomb attack in New York, and Taliban leaders based in the country’s volatile tribal belt, Interior Minister Rehman Malik said today. Pakistan today test fired two short-range ballistic missiles capable of carrying nuclear and conventional warheads and striking Indian cities, with Premier Yousuf Raza Gilani saying it was time for the world to recognise his country as a “de jure” atomic power. Chairman of the agitating main opposition Unified Communist Party of Nepal-Maoists Pushpa Kamal Dahal, alias Prachanda, on Saturday issued a two-day ultimatum to the government to meet his party’s demands. Somali pirates armed with rocket- propelled grenades and automatic guns hijacked a chemical tanker off East Africa with 22 crew members, a majority of them Indians, on board, the European Union Naval force said today. Britain’s Conservatives and Liberal Democrats will hold talks on Sunday after an inconclusive election, but are unlikely to agree on a new government before markets open on Monday, the Conservatives said. The talks will be face-to-face between the two parties but not involve the leaders, a Conservative party spokesman said. Britons denied the right to vote due to chaos at polling booths could be entitled up to £750 compensation each, a lawyer has said. Voters in at least 14 constituencies in eight cities, including London, Sheffield and Birmingham were affected by the chaos. Long queues formed outside polling stations as returning officers were overwhelmed by the numbers wanting to vote. Several were turned away after queueing for hours. The centre-right Conservatives under David Cameron won the most parliamentary seats in Thursday’s election but need the support of other parties to form a stable government that can tackle a record budget deficit. A deal with the much smaller centre-left Liberal Democrats might achieve that and give the LibDems their first shot at government in decades. But leader Nick Clegg must overcome scepticism among a significant number of his party, who fear that Britain’s third largest party would be forced to sacrifice too many cherished policies for a deal. Clegg said on Saturday that four core areas of tax, education, economic recovery and fundamental political reform were main issues. “It’s precisely those four changes which will guide us in the talks ahead,” he said before a meeting with senior LibDem politicians. Financial markets, already rattled by a debt crisis in Greece, want a new government to be formed quickly so it can set about reducing the deficit swiftly and decisively. The pound, British government bonds and the London stock market all fell on Friday when it became clear the Conservatives would not have a parliamentary majority, but sterling and bonds recouped early losses on the prospect of a deal with the LibDems. There is no deadline for a deal but prolonged negotiations are likely to rattle markets. Conservative leader David Cameron left open the format a deal might take when he offered on Friday to work with the LibDems. This could be a coalition, a rarity in Britain, but is more likely to involve a pact in which the LibDems agree to support a Conservative-led minority government in implementing an agreed legislative programme, in return for concessions. Senior members of both parties met on Friday night and further talks are expected over the next few days. The most important hurdle is agreement on the pace of lowering the budget deficit. The Conservatives have pledged to start cutting it immediately but the LibDems say this could harm Britain’s recovery from a deep recession in 2008-2009. Britain’s role in the European Union, immigration, defence, and electoral reform are also likely to be stumbling blocks. The Lib Dems have long pushed for a change to the current electoral system, which is stacked against smaller parties, in favour of proportional representation. Clegg has to persuade Lib Dem members of parliament that it is worth making concessions, even though many party members are sceptical. “I will never consider voting for the Lib Dems again if a Conservative/LibDem pact is the outcome of this election!” one supporter said on Liberal Democrat Voice, a web site for party activists. If the LibDem/Conservative talks fail, a deal between Clegg’s party and Labour is possible, but more complicated as the two parties combined would not have enough MPs to command a majority in the 650-seat House of Commons. A Lib Dem-Labour deal would therefore have to involve small regional parties such as Wales’s Plaid Cymru and the Scottish National Party. The US today formally requested Pakistan’s cooperation in investigations into Shahzad’s alleged links with militants in the tribal areas, Malik told reporters during an interaction at his residence. However, Malik contended it would be premature to link the incident in New York with the Waziristan tribal region in northwest Pakistan. “We will investigate the reports of Faisal Shahzad’s visit to Waziristan,” he said. The US provided some details about the charges against Shahzad in its formal request for cooperation, Malik said. “They think that Shahzad has been visiting South Waziristan and meeting (Taliban commanders) Qari Hussain and Hakimullah Mehsud. But it all needs confirmation,” he said. Hakimullah is the head of the Tehrik-e-Taliban Pakistan while Hussain is considered the trainer of suicide bombers. A complaint filed in a US court by the FBI said Shahzad had received bomb-making training in Waziristan. Malik made it clear that only Pakistani agencies will investigate the matter and no foreign team will be allowed to come to the country for this purpose. Karachi: Pakistani intelligence officials are tracing links between Times Square bombing plot suspect Faisal Shahzad and the banned terror group Jaish-e-Muhammad (JeM) led by Maulana Masood Azhar. This search has led investigators to the sprawling, marble-floored Batha Mosque and a religious school in a crowded neighbourhood of Karachi which was once provincial headquarters of the JeM and which is visited at times by the elusive militant leader, who was released from an Indian jail in 1999 in exchange for a hijacked Indian Airlines plane. The mosque patronised by the JeM is under scrutiny and security and intelligence sources say there is a link being established between Faisal and the people running the mosque. The armed forces conducted “training launches” of the Shaheen-I missile with a range of 650 km and the Ghaznavi missile with a range of 290 km at the conclusion of an annual field training exercise of the Army Strategic Force Command. The tests carried out in the presence of Gilani were aimed at “testing the operational readiness of Strategic Missile Groups equipped with Ghaznavi and Shaheen missile systems,” said a statement from the Inter-Services Public Relations. Addressing troops in the exercise area, Gilani “emphasised that it is time for the world to recognise Pakistan as a de jure nuclear power with equal rights and responsibilities,” the statement said. Gilani demanded that the country be given a waiver by the Nuclear Suppliers Group for civil nuclear energy cooperation as “energy is a vital economic security need of Pakistan and nuclear energy is a clean way forward.” “Pakistan is capable of providing nuclear fuel cycle services under IAEA safeguards, and this offer was also made at the Nuclear Security Summit” in Washington last month, he said. Gilani said, “There is now a need for the world to move on beyond safety and security concerns. These were laid to rest at the Nuclear Security Summit (hosted by the US) where Pakistan forcefully projected her forthright stance on the issue and the world expressed satisfaction at Pakistan’s nuclear security arrangements.” Pakistan had developed a “strong nuclear deterrence capability” and the armed forces are “fully capable of safeguarding Pakistan’s security against all kinds of aggression,” he said. 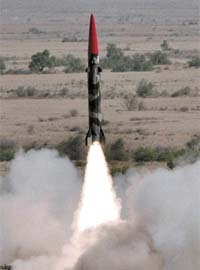 Gilani assured the military that his government will “continue to support the strategic programme and meet all its needs.” Both Ghaznavi, also known as Hatf-III, and Shaheen I, also known as Hatf-IV, can carry conventional and nuclear warheads and are capable of hitting Indian cities. Apart from Gilani, the launch of the missiles was witnessed by a gathering that included Joint Chiefs of Staff Committee Chairman Gen Tariq Majid, naval chief Admiral Noman Bashir, Strategic Plans Division Director General Lt Gen (retd) Kahlid Kidwai and senior military officials. Just a day after he announced to withdraw indefinite general strike, Prachanda said even after suspending their indefinite general strike his party would join the negotiating table with the ruling alliance. He said now the ball is in the ruling parties´ court. “We will wait and see their response for couple of days and our party will take its step as per your decision,” he said. Regarding the latest party decision to suspend general strike he said it has not withdrawn the protest programmes rather it has only changed the nature of it. He also said the party would launch further stringent protest programmes if the ruling parties fail to come up with consensus proposals regarding Maoist demands on peace process. Regarding the Maoist demand, Prime Minister Nepal and the ruling Nepali Congress have said he Maoists should translate the past pacts and understandings related to the peace process and ensure a conducive atmosphere in this regard. Spokesman Cmdr John Harbour said there was little chance that military forces could storm the ship because officials don’t believe the crew all made it to a safe room before the pirates boarded. The crew consisted of 19 Indians, two Bangladeshis and one Ukrainian, he said. The ship — the Marida Marguerite — was heading from India to Belgium. Also today, Taiwan's Foreign Ministry said a Taiwanese fishing boat was hijacked off the Somali coast by pirates, who demanded a ransom for the crew.